Mary Cummins, investigative reporter, writer, speaker, activist in Los Angeles, California "Mary Cummins - Cummins Real Estate Services, appraiser, appraisal in Los Angeles, California - Mary Cummins, Cummins-Cobb, Cobb"
UPDATE: 04/23/2019 38 dogs were just impounded from her home. 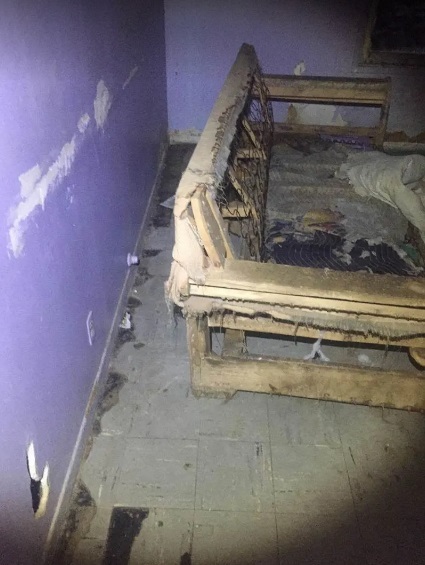 Her home is described as in disrepair. 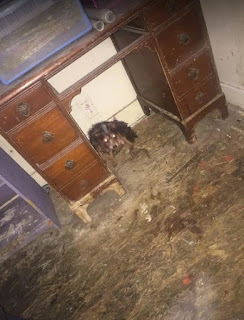 Here are a couple of photos courtesy of animal control. The dogs appeared to have eaten the walls, floor and couch. Spay and neuter, people. No need for this overpopulation of unwanted dogs. 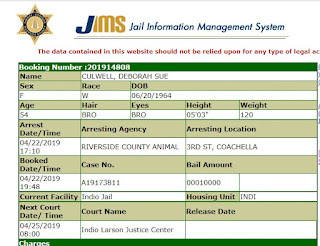 ORIGINAL: Deborah Sue Culwell aka Debra Sue Culwell aka Debbie Sue Culwell aka Sarah Garcia has a criminal history. 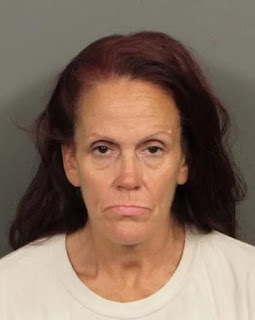 She was charged with seven felony counts of 597(A) animal cruelty and seven misdemeanor counts of abandoning an animal 597 S.
Deborah Sue Culwell born June 20, 1964 is 5'3" 120 lbs 54 years of age, brown hair, brown eyes, white. She attended Desert Christian High School. 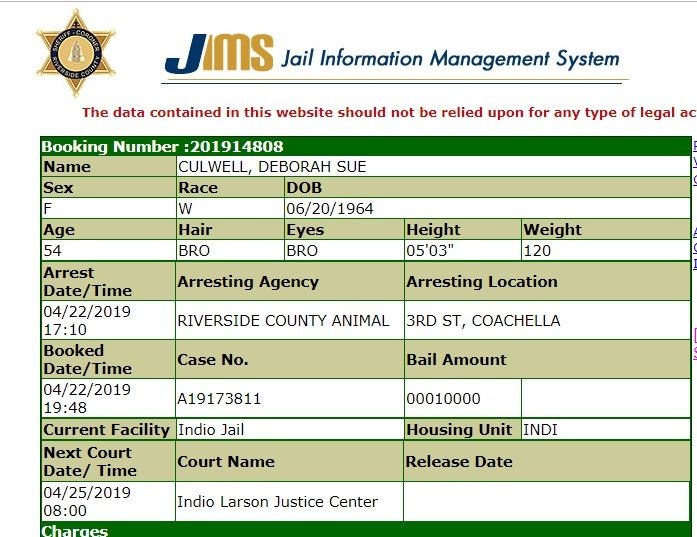 She is currently in Indio jail at the Indio Larson Justice Center. Her bail is $10,000 which she hasn't posted as of yet. Below is the current case. Here it is as a pdf which is easier to read. Arrest information. 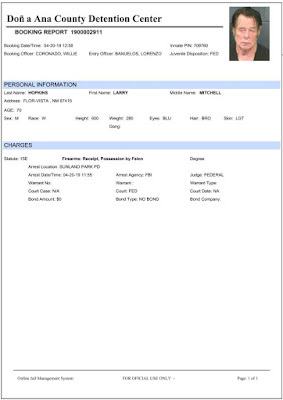 Her next hearing is April 25, 2019 at 8:00 a.m.
She was arrested in 2011 for fictitious bill/note, forge/sign as fictitious person, receiving stolen property, possess controlled substances, defraud property of another, possess controlled substance paraphernalia. She was convicted of fictitious bill/note, receiving stolen property and possess controlled substances. She was given 36 months probation. This Defendant Does Not Have Any Other Cases With Future Hearings Scheduled. 04/22/2019 DECLARATION BY LAW ENFORCEMENT FOR WALK-THROUGH ARREST WARRANT AND ORDER. 04/22/2019 JURISDICTION SET TO BL BY OTS310. Below is a previous case from 2011. Here it is as a pdf. 1) OBEY ALL LAWS, ORDINANCES, AND COURT ORDERS. 2) BE COMMITTED TO THE CUSTODY OF THE RIVERSIDE COUNTY SHERIFF FOR 120 DAYS; 111 DAYS TO BE SERVED IN THE WORK RELEASE PROGRAM. REPORT ON OR BEFORE 08/01/2011. 3) PAY VICTIM RESTITUTION. AMOUNT TO BE DETERMINED BY THE PROBATION DEPARTMENT (PC 1203.1(A)(3)). ANY DISPUTES AS TO RESTITUTION AMOUNT TO BE RESOLVED IN A COURT HEARING. 4) DO NOT KNOWINGLY USE NOR POSSESS ANY CONTROLLED SUBSTANCES, UNLESS LAWFULLY PRESCRIBED FOR YOU. 5) SUBMIT TO CHEMICAL TESTS OF BLOOD, SALIVA, BREATH, OR URINE, OR ANY REASONABLE PHYSICAL TEST UPON REQUEST OF PROBATION OR ANY LAW ENFORCEMENT OFFICER. 7) PROVIDE A DNA SAMPLE AS DIRECTED BY PROBATION OR LAW ENFORCEMENT PERSONNEL (PC 296(A)). AUTHORIZED AGENCY TO FORWARD SPECIMENS TO DOJ FOR ANALYSIS. DEFENDANT TO SHOW PROOF OF COMPLIANCE TO CLERK OF THE COURT WITHIN 30 DAYS. 9) PARTICIPATE AND COMPLETE AT YOUR EXPENSE ANY COUNSELING, REHABILITATION/TREATMENT PROGRAM DEEMED APPROPRIATE BY PROBATION OFFICER; AND AUTHORIZE THE RELEASE OF INFORMATION RELATIVE TO PROGRESS. 10) DO NOT ASSOCIATE WITH ANY UNRELATED PERSON YOU KNOW TO BE ON EITHER PROBATION OR ON PAROLE. 11) NOT LEAVE THE STATE OF CALIFORNIA WITHOUT FIRST OBTAINING WRITTEN PERMISSION OF THE PROBATION OFFICER. 12) INFORM THE PROBATION OFFICER OF YOUR PLACE OF RESIDENCE AND RESIDE AT A RESIDENCE APPROVED BY THE PROBATION OFFICER. 13) GIVE WRITTEN NOTICE TO THE PROBATION OFFICER 24 HOURS BEFORE CHANGING YOUR RESIDENCE AND DO NOT MOVE WITHOUT THE APPROVAL OF THE PROBATION OFFICER. 15) TERM: HARVEY WAIVER ON ALL DISMISSED COUNTS. 16) IF EXPELLED OR DEPORTED, DO NOT RE-ENTER THE UNITED STATES ILLEGALLY. IF EXPELLED OR DEPORTED, DO NOT RE-ENTER THE UNITED STATES ILLEGALY. 17) IF EXPELLED, DEPORTED, OR VOLUNTARILY LEAVE THE UNITED STATES, YOU MUST REPORT TO PROBATION BY TELEPHONE OR IN WRITING WITHIN 30 DAYS OF DEPARTURE. 18) REPORT TO PROBATION OFFICER IMMEDIATELY OR WITHIN 2 DAYS OF RELEASE FROM CUSTODY FOR INITIAL INSTRUCTIONS, AND FOLLOW ALL REASONABLE DIRECTIVES OF PO. 19) REPORT ANY LAW ENFORCEMENT CONTACTS TO THE PROBATION OFFICER WITHIN 48 HOURS. 20) PAY ADMINISTRATIVE FEE EQUAL TO 15% OF VICTIM RESTITUTION (PC 1203.1(L)). 21) PAY THE ACTUAL COST OF COURT ORDERED DRUG TESTING THROUGH THE COURT AS DIRECTED BY ENHANCED COLLECTIONS DIVISION. 03/13/2013 VICTIM RESTITUTION INITIATED BY RTM. 02/24/2013 IVR/E-PAY IT: DEFENDANT MAKES FINE PAYMENT. 01/20/2013 IVR/E-PAY IT: DEFENDANT MAKES FINE PAYMENT. 12/18/2012 IVR/E-PAY IT: DEFENDANT MAKES FINE PAYMENT. 11/14/2012 IVR/E-PAY IT: DEFENDANT MAKES FINE PAYMENT. 10/15/2012 IVR/E-PAY IT: DEFENDANT MAKES FINE PAYMENT. 09/16/2012 IVR/E-PAY IT: DEFENDANT MAKES FINE PAYMENT. 08/13/2012 IVR/E-PAY IT: DEFENDANT MAKES FINE PAYMENT. 07/13/2012 IVR/E-PAY IT: DEFENDANT MAKES FINE PAYMENT. 06/13/2012 IVR/E-PAY IT: DEFENDANT MAKES FINE PAYMENT. 04/28/2012 IVR/E-PAY IT: DEFENDANT MAKES FINE PAYMENT. 04/18/2012 OPERATOR AUTCK CHANGED DTP FROM 04/18/12 TO 05/18/12. 03/11/2012 IVR/E-PAY IT: DEFENDANT MAKES FINE PAYMENT. 02/17/2012 IVR/E-PAY IT: DEFENDANT MAKES FINE PAYMENT. 01/22/2012 IVR/E-PAY IT: DEFENDANT MAKES FINE PAYMENT. 12/16/2011 IVR/E-PAY IT: DEFENDANT MAKES FINE PAYMENT. 11/17/2011 IVR/E-PAY IT: DEFENDANT MAKES FINE PAYMENT. 10/15/2011 IVR/E-PAY IT: DEFENDANT MAKES FINE PAYMENT. 10/13/2011 PROOF OF COMPLETION ELECTRONIC MONITORING FILED. 09/17/2011 IVR/E-PAY IT: DEFENDANT MAKES FINE PAYMENT. 08/16/2011 IVR/E-PAY IT: DEFENDANT MAKES FINE PAYMENT. 07/13/2011 MAKE PAYMENT OF $80.00 PER MONTH, ON THE 18TH OF EACH MONTH; CONTINUE THEREAFTER UNTIL PAID IN FULL. 07/12/2011 NOTICE OF BAIL BOND EXONERATION FILED. 06/14/2011 REQUEST FOR CONTINUANCE PURSUANT TO PC 1050 FILED. 06/07/2011 BAIL BOND #527125786-4 FILED. 06/06/2011 FELONY FINGERPRINT FORM FILED. 06/03/2011 O.R. APPLICATION AND REPORT FILED. 05/20/2011 CASE SENT TO: FILED. 05/19/2011 CASE SENT TO: INDIO RECORDS. 05/12/2011 DECLARATION IN SUPPORT OF ARREST WARRANT FILED. 05/12/2011 CASE SENT TO: 1A. 05/12/2011 JURISDICTION SET TO IN BY OTS310. UPDATE 04/23/2019 Just when you think the story can't get any crazier it does. Larry here also uses AKA Scott A Curtiss. He has married a few women and fathered at least four children. He abandons them and doesn't pay child support. US tracked him down a few times and threw him in jail for not paying child support. He owes a ton of money. Here is just one claim. This is why he keeps moving from state to state and using different names. He married Connie Frederick February 1994. She annulled the marriage when she realized he used many names including Johnny Horton Jr and Larry Hopkins. He also uses the names Pablo and Commander John. Larry was also still married to his previous wife. Connie gave birth to a child 1994/1995. Here are just a few of his federal cases. Larry is extradited to South Dakota. This has to do with his many child support lawsuits from the US. He is listed as likely to flee and a danger to society. Larry is again indicted for failure to pay child support. 04/22/2019 Just fyi. This case doesn't show up in the Pacer system. You have to manually search New Mexico ecf in order to find the case. I posted these documents early this morning then tweeted it and put it on FB. Two hours ago around 1:00 p.m. I posted today's minutes and the schedule. Around 2:00 p.m. NBC, CBS, Daily Beast and New York Times picked it up. I see some of them copied my files with no credit. I put a watermark on my files so I can see where they end up. Here is the criminal complaint. This goes back to October 2017. FBI noticed alleged militia extremist activity located at Lakeside Ranch Trailer Park in Flora Vista, New Mexico. Larry is the "commander." There are about 20 members who are armed with AK-47 rifles and other firearms. They were allegedly training to assassinate George Soros, Hillary Clinton and Barack Obama because they allegedly support "Antifa." FBI agents went to Larry's home. They were invited in to his office where they saw 10 firearms leaning against the wall in plaint view. Larry said all the guns were owned by Fay Sanders Murphy whom he called his common law wife. Hopkins and Murphy signed a consent to search form. Dumb criminals. November 15, 1996 Hopkins pleaded guilty to felon in possession of a loaded firearm. He was sentenced to 16 months minimum to two years maximum. December 2006 Hopkins was convicted of felony possession of a weapon-firearm and was sentenced to 40 days in jail and 36 months probation. He was also convicted of criminal impersonation of a peace officer and sentenced to 20 days in jail and 24 months probation. 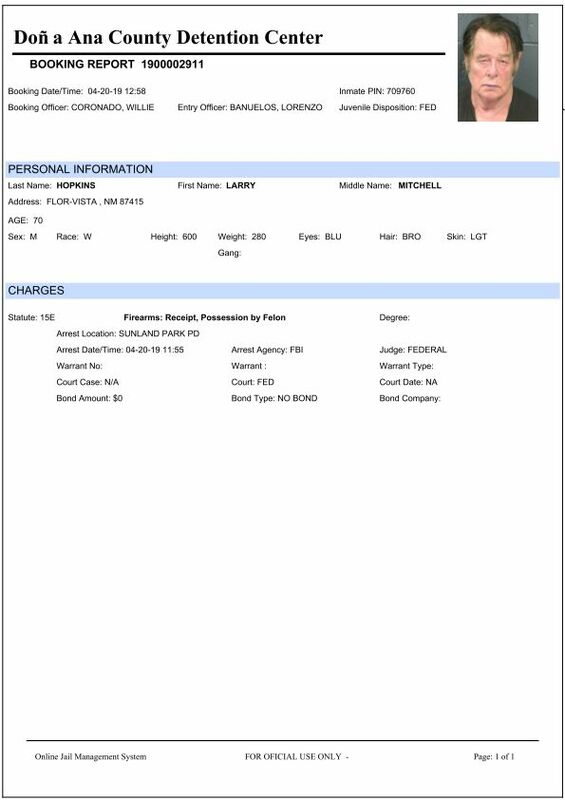 Here is the warrant for his arrest. Larry appeared in court today. "His lawyer said his client just thought he was "doing his American right in helping out." “Helping to intercept people that they believe are coming across illegally and getting them to ICE or Border Patrol,” said defense lawyer Kelly O’Connell. He could face 10 years behind bars with three additional years supervised and $250,000 in fines if he's found guilty. The trial will be in Albuquerque. Hopkins remains in custody until his next court date on April 29. 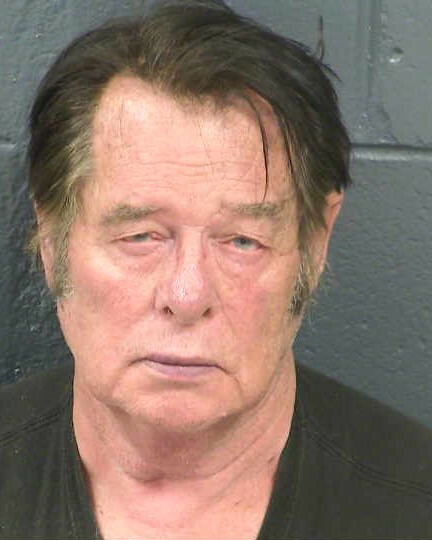 According to the criminal complaint, Hopkins unlawfully possessed nine firearms and ammunition in his home in San Juan County, N.M., in Nov. 2017. The complaint alleges that Hopkins was prohibited from possessing firearms or ammunition because he previously had been convicted of at least three felony offenses, including possessing a loaded firearm in the state of Michigan in 1996; being a felon in possession of a firearm in the state of Oregon in 2006; and impersonating a peace officer in the state of Oregon in 2006." They clearly missed his other felony offenses under his AKA Johnny Horton Jr and Pablo. Below is the criminal docket. 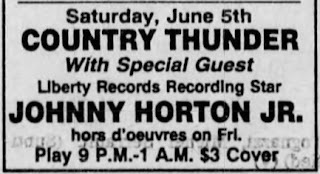 04/21/19: Larry Hopkins committed many crimes as Johnny Horton Jr. He was arrested for passing bad checks to his employees in Missoula, Montana in 1978. Judge sentenced him to ten years in Montana state prison. Judge reduced it down to five years. He wrote eight bad checks for $2,452 as payment for wages to his employees. He ran "John Horton Pole Co." He was convicted of a felony. "Libby District Judge Robert M. Holter, acting for District Judge E. Gardner Brownlee, sentenced Johnny Horton Jr., also known as Larry Hopkins, 28, Alsip, Ill., to 10 years in Montana State Prison Friday for issuing a bad check, a felony. Holter suspended five years of the prison term providing Horton make restitution. Holter also allowed credit for the nine months Horton has already served in the county jail." May 9, 1981 he was exposed as a fraud by the late wife of Johnny Horton. This was carried in many articles in many states and even Canada. Article in Corvallis Gazette-Times. Larry admitted he was a lying fraud. Late wife still wanted to sue him in civil court. Late wife was so upset that she flew to Spokane, Washington to tell him he should not steal. Larry had just married a woman the day before. The woman quickly annulled the marriage due to fraud. He is referred to as a "drifter" from Tyler, Texas. Larry swore he'd never do it again but he did. He was found out because the drummer checked his background. The drummer! He found out that Johnny Horton Sr did not have any sons. In his singing act he talks about his "wonderful memories" with "daddy." Title of newspaper article is "Widow exposes singer's son as impostor." Below is text of the article. "Widow exposes singer's son as impostor. SPOKANE. Wash. (AP) - He said he was the son of the late country music star Johnny Horton, but his Nashville-style charade ended abruptly in a confrontation with Horton's angry widow. Before the denouement, however, the wavy-haired impostor had fooled more than a few local country-music buffs. The man, who later Identified himself as David J, Horton Jr., 32, a drifter from Tyler, Texas, discussed the hoax Friday at the Hanging Tree Tavern, where he was performing until being unmasked by Billie Jean Horton. "If I was wrong for what I did, for loving a man's music and what he stood for, then I guess I'm wrong," be said, "but I'll never do It again." 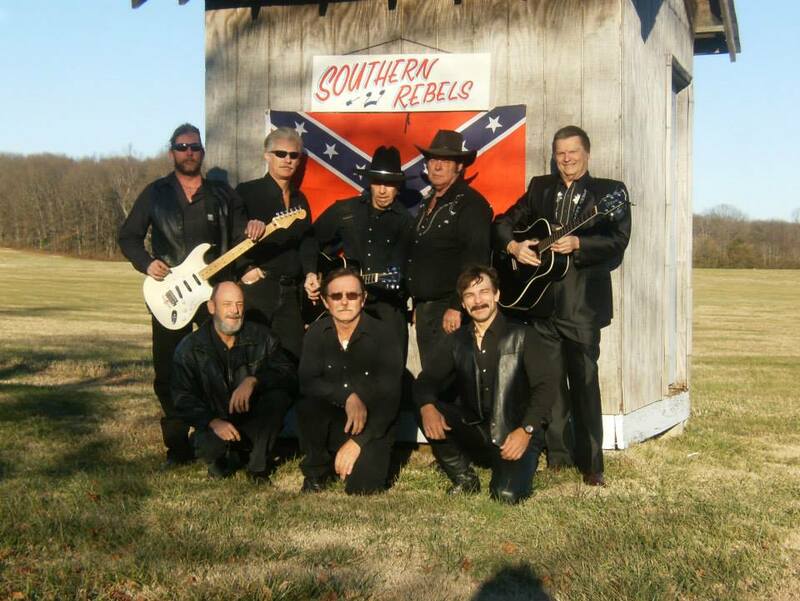 Over the past two weeks, those taken in by the deception included KZUN radio, a country music station, as well as Virginia Iler, owner of the Hanging Tree. "He said he was in town when he started having troubles with his bus, which had broken down," Mrs Iler said. When he later asked to work as a singer, she said, "My mistake was not pulling his I.D., old gullible me. I was excited about someone that important coming in." 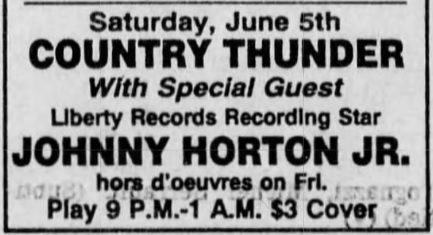 He was hired to sing, and Iler advertised his act on KZUN, Disc jockey Wayne Stepp heard the news and inter viewed Horton, "We had never heard of Johnny Horton Jr.," he said. Program director Don Owen was skeptical and grilled the man about his knowledge of the country-music scene. "I was convinced he was who he said he was," Owen said. Then Bob Levan, a drummer in the backup band, became curious and checked the late country singer's background. Horton, who became famous In the early 1960s with "The Battle of New Orleans," died in a car accident in Milano, Texas, on Nov. 5, 1960. Levan found the singer had two daughters but no sons. Mrs. Horton was telephoned in Shreveport, La. "She was super hot about it," said Stepp, She was so hot, in fact, that she hopped the next plane and arrived to confront the bogus Horton a day after he was married to a 29-year-old Spokane woman. When the bride learned that her husband was not the son of the famous singer, she stormed out of the tavern. "I think maybe she married me for the name rather than for myself," Horton said. After listening to Horton's act, filled with "memories" of his "daddy," Mrs. Horton said, "I was choking. It hurt me a lot." She told the imposter she forgave him but added, "The Bible also says you should not steal, and you're stealing from Johhny Horton still a great name in country music and I hope they put you in prison for a long time." Local authorities said the imposter broke no laws, but a spokesman for the widow said she might file a civil suit to enjoin Horton from representing himself as her late husband's son." Click to see the article larger. Below is from 1993. He pretended to be Johnny Horton Jr up to today. Larry has a few daughters whom he abandoned. He tells people he knows/knew Elvis and talks to him. He also said he talks to Bush and Trump. He's a con man and a story teller. He uses these lies to rip people off. He claims he has DNA evidence that he is the son of Johnny Horton. Johnny Horton wasn't married until 1952. Larry was born 1949. So he's claiming he's a love child? 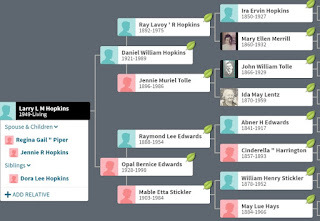 The divorce docs in 1952 clearly show that his father is Daniel William Hopkins and not Johnny Horton. Larry are pretended to be Elvis' cousin. Recently he again said he was the son of Johnny Horton. He said he was going to play at the Grand Ole Oprey in this video. He also says he's Native American. He is not. Someone who knows him left this YouTube comment. This man is a total fraud. His real name is Larry Hopkins, and he's nothing but a gypsie drifter who makes his living ripping off unsuspecting musicians to back him up. This man is NOT Johnny Horton's illegitimate son, has no relation only a tribute performer, and a bad one at that. He stole money from a band I used to play in, when setting up a concert 6/17/2012, at the Civic Center in Farmington, NM. He can't sing with a damn, and is a pathological liar. This man was investigated by the FBI, and nothing good was reported by them. He will deny everything said without conscious. Best advice is to avoid this man with mental disorder and stick to people with noted credentials. Only then will you not be sorry.﻿"
1986 in Michigan. Arrested for impersonating Johnny Horton Jr. He was arrested at the show. They proved who he was in jail but he'd been paid half up front. His story. He said he got a Governor's pardon. 2006 he wasn't impersonating a police officer. He was wearing a fugitive recovery uniform per Hopkins. He also believes he was pardoned. He said if you're clean for ten years, you're not longer a convicted felon. Whatever. Radio guy asked him about "stolen valor" charge. He said it was a "stolen vehicle" charge. He said he was in the army. There was a case in California where someone with his exact name and age stole a car while going AWOL from military. Larry has been in Missoula. He was arrested for a felony for passing bad checks in 1977, 1978. This stolen valor charge seems to be true. I believe this is the same Larry Hopkins. He used AKA "Pablo" which he also used when he was "Johnny Horton Jr." This guy has had a felony criminal record since at least 1968 at the age of 19. I think Larry told his girlfriend he was in the military. Then he stole her car. She then told the police he was AWOL from the military. I don't believe this guy was ever in the military. I see no documentation at all. Just another lie. "AWOL Serviceman Arrested at Polson . POLSON - Larry Mitchell Hopkins, 19, of Happy Camp, Calif., was picked up by Lake County Sheriff's officers Tuesday on a federal warrant for interstate transportation of a stolen vehicle. He has been transferred to Missoula. 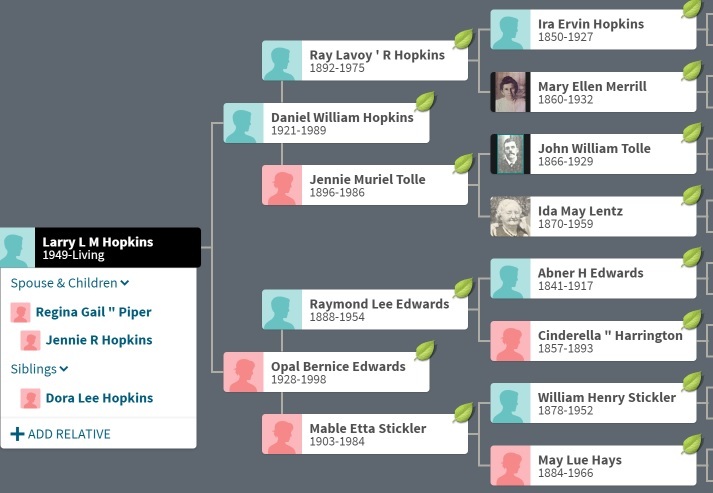 Hopkins reportedly is AWOL from the service and is charged with the auto theft in another state." November 1968. He said he has 16,000 acres. He is on 3 acres which he doesn't own. He lives in a trailer park. The lies! Larry said he has the right to zip tie "illegals." He can shoot the "illegals." The law states you can't touch immigrants. Larry says he's Elvis' cousin (and Elvis is still alive!). He also said he is the illegitimate son of Johnny Horton. He said he has an ID with that name that proves that ;-) Below is his family tree. ORIGINAL: Larry Mitchell Hopkins was arrested by the FBI with the Sunland Park Police Department. He is currently jailed in Dona Ana County Detention Center in New Mexico. Below are booking details. Larry also goes by the AKA Johnny Horton Jr. He pretends to be the son of a famous singer which is totally false. He runs UCP United Constitutional Patriots which used to be United Constitutional Militants. 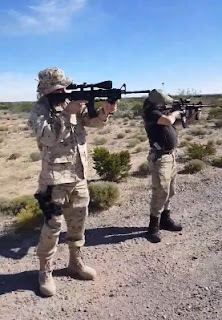 He and his friends were out at the border with their loaded weapons rounding up immigrants. They are not associated with border patrol or the government. Larry is a convicted felon and has a lengthy criminal record. He's been arrested for felon with a weapon quite a few times. How did he buy these guns? Clearly not legally. Larry was born June 15, 1949 most likely in Ashland, Oregon. He's lived in Michigan, Oregon, California, New Mexico and maybe Texas. State says he's 70 but FBI says he's 69. He is 69 turning 70 in June. He lives in Flora Vista, New Mexico 87415. He's 6' tall, 280 lbs, blue eyes, brown hair and light skin. "SUMMONS FOR PUBLICATION No. 52-65S-E IN THE CIRCUIT COURT OF THE STATE OF OREGON FOR JACKSON . COUNTY OPAL BERNICE HOPKINS, Plaintiff, vs, DANIEL WILLIAM HOPKINS, Defendant. TO THE ABOVE NAMED DEFENDANT DANIEL WILLIAM HOPKINS THE NAME OF THE STATE OF OREGON: You are hereby required to appear and answer the Complaint filed against you in the above suit on or before the last day of four weeks from the date of the first publication of this Summons, said period of four weeks time prescribed for publication hereof, and if you fail to appear and answer said Complaint, for want thereof the Plaintiff will apply to the entitled court for the relief demanded in her Complaint succinct statement of which is as follows, to-wit: That a decree of the court be made and entered dissolving the bonds of matrimony existing between plaintiff and defendant; granting unto plaintiff the care, custody and control of Dora Lee Hopkins and Larry Mitchell Hopkins, minor children of plaintiff and defendant, with the right on the part of defendant to visit said children at reasonable times and places; ordering defendant to pay unto the clerk of the above entitled court the sum of $50.00 per month for the support, care and maintenance of each of said minor children, and the further sum of $50.00 per month for plaintiff's support and maintenance during her lifetime or until she remarries; decreeing plaintiff to be the owner of the 1948 Buick automobile now owned by plaintiff and defendant, free and clear of any right, title and interest of defendant therein; granting plaintiff her costs and disbursements, and such other and further relief as the court may deem just and equitable." Opal then married Albert King. Larry lived with his mother in Ashland, Oregon in 1993 with her husband King. He may have been married and divorced Regina Gail Piper in the '70's. "Larry Mitchell Hopkins, 25, of Seymour. He had been charged with impersonating a peace officer in connection with an incident on June 7 at Eighth and Lee in which a man posed as a policeman." Nov 26, 1975, The Odessa American, Odessa, Texas. "Indicted included: Larry Mitchell Hopkins, 25, for escaping from federal custody." The Odessa American, Odessa, Texas, Mar 8, 1975. October 1977 he was arrested for passing a bad check in Missoula, Montana. "Johnny Horton Jr., 28, Pablo, also known as Larry Hopkins, pleaded guilty Thursday to a felony charge of issuing a bad check." 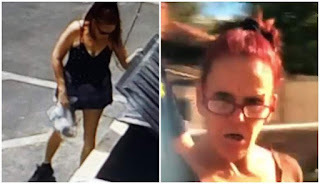 I see arrest in California for someone same exact name and age for stealing a motor vehicle and crossing state line while AWOL from the service. Still verifying. Larry did once live in California because he got divorced there. He doesn't just use the name Johnny Horton Jr. He pretends to actually be him. He said he was with his dad the singer Johnny Horton Sr when he was sworn into the hall of fame in this video. Johnny Horton only had two daughters, no sons at all. His daughters were born after 1953. This guy is a total con man. His entire life is a fraud. I bet he only got gigs by pretending to be Johnny Horton Jr. Some have noted that he doesn't even know the lyrics to Johnny Horton's songs which he sang. United Constitutional Patriots has a Facebook page here. They have a location which looks like it's in the middle of nowhereville 7A Road 3547, Flora Vista, New Mexico, (505) 334-2492. It's a 784 sf studio trailer home built in 1977. It looks like a 12' x 45' trailer home. They used to be United Constitutional Militia. Larry says that is their militia training facility. Hope the FBI has already searched that facility. He probably has more guns there. Below is satellite image of the place. A woman named Jennie is now stating she is Larry's daughter. She was allegedly born in Illinois where Larry once lived. Paypal has suspended their donation account. They're asking for checks sent to Mark Cheney, 7A Road 3547, Flora Vista, NM 87415. These people are at the border next to vehicle blocks. They think that's the border "wall." They're upset there is no military there. Why would military be at the border? Border patrol would be there. I see no immigrants at all in the videos yet they're standing there aiming assault rifles at the vehicle block which is 100 meters away. He goes by Johnny Horton Jr. on Facebook and YouTube. In 2006 he was arrested for impersonating a police officer. If he wants to become a police officer so badly, why didn't he just sign up? Because felons can't be police officers. In 2013 he was arrested for driving without a driver's license in New Mexico. He was previously arrested in Michigan. "The district court in Midland County, Michigan only had one page remaining on file from the 1986 case — a felony “register of actions” that gave few details on the arrest." More photos. 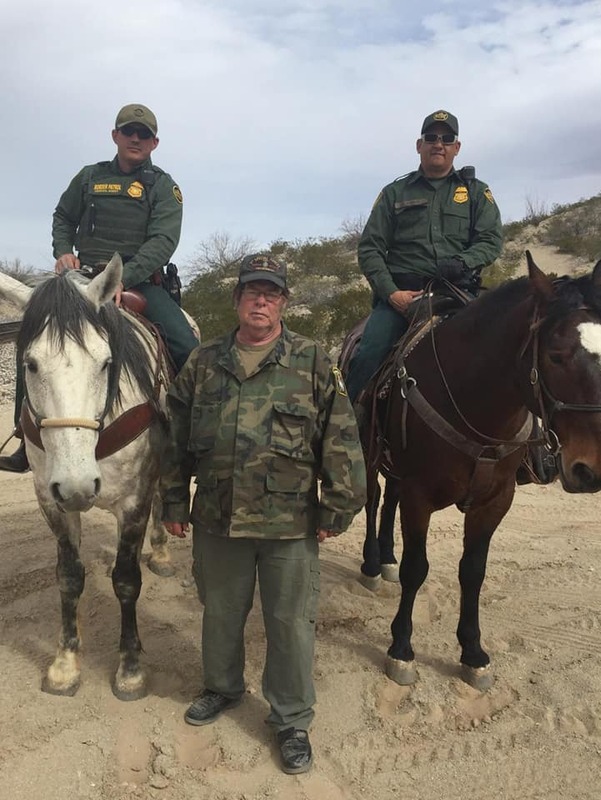 Taking pics with Border Patrol to try to make it appear he works with them.